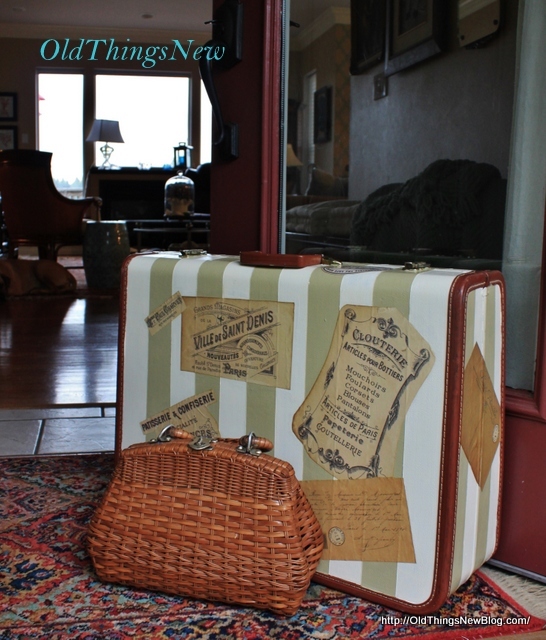 I love the look of old trunks and suitcases and I’ve been wanting to do a vintage suitcase makeover for some time now. I must admit that mine in a knockoff of one I saw on another blog, but I can’t remember exactly where. Can anyone help me with that? Maybe it’s you and I’d love to give you credit. The vintage suitcase I used came from my in-laws garage sale and it is exactly like one that my parents had when I was a child. This made it especially appealing to me. 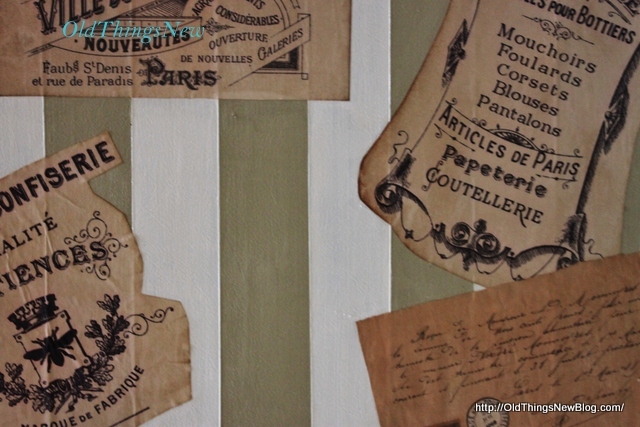 I started by taping it off for the stripes and began painting, using two colors of Annie Sloan Chalk Paint, Old White and Versailles. 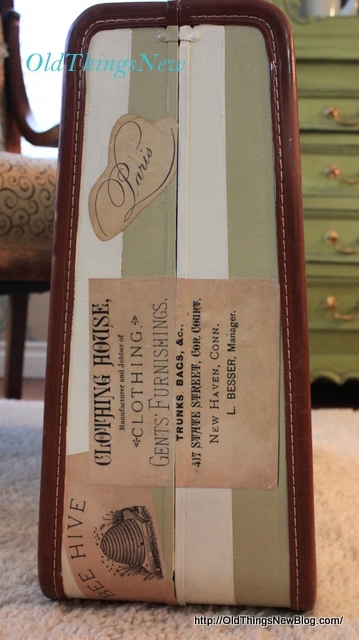 The pictures that I decoupaged onto the suitcase came from The Graphics Fairy website, of course. The number of my projects that have revolved around that website I can’t even say! 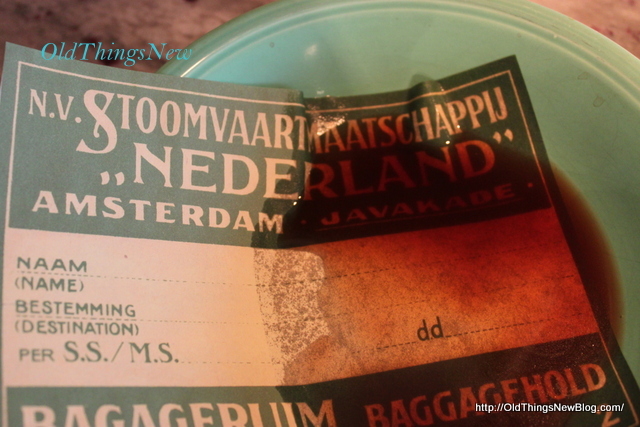 To age the graphics a bit I dipped them in strong coffee and laid them out on a foil-lined cookie sheet. I “baked” them at 200 degrees for about 4 minutes (watching them closely to avoid a fire) and then laid them out on a wire rack to finish drying. After Mod Podging the graphics in place I sealed everything with two coats of MinWax Polycrylic. 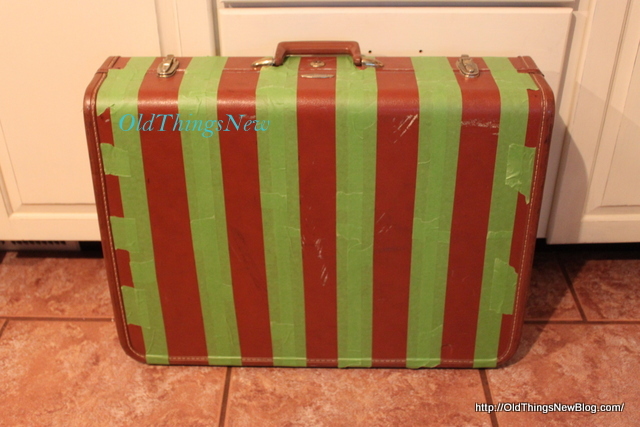 Funny, Mr. OTN liked the color combo and he thought it looked cool with the graphics applied but he was VERY concerned that it was no longer useful as a piece of luggage, “It will be ruined if someone uses it for travel!” I patiently explained to him that this isn’t meant to be used as a piece of luggage anymore but as a piece of home decor. “Why are you staging it for pictures like it’s going on a trip if it’s no longer luggage?”, I can hear Mr. OTN thinking in his head. I haven’t come up with a good answer for him yet. If I don’t sell this I’d better find something to do with it in my home. Maybe I’ll pad the inside and make it a bed for the dogs . . . that would make Mr. OTN happy . . . or it could be stacked with some other pieces of luggage and used as a side table in his office. I actually kinda like it just sitting in my front entryway looking like some interesting guests have just arrived for a stay. What are your ideas? What would you do with this suitcase? Does it even really need to have a purpose? « Take the Test: How Well Do You See Color? Oh my goodness! I love the stripes and the graphics! 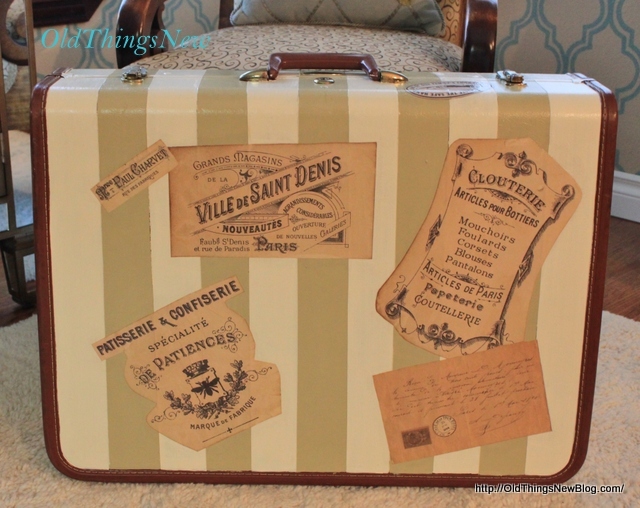 I so want to do this to a suitcase…so pretty! This looks great Patti! Love the transformation! I’ve seen people use them stacked as side tables. Perhaps you could cut some legs off a thrift store find (or buy some legs at the hardware store) and use the suitcase as the “top”? However, you’d lose seeing some of the great graphics. Love it! I have seen quite a few suitcases but I always pass them up because the color is always really wrong! Hey! I have that same suitcase…. But mine isn’t nearly as cute!! Good work, Patti! You can come over and do mine any day… If I’m not home just let yourself in… heeheehee….!!!! Hey…I have that same luggage in the waiting line out in my cottage…maybe I will be a copy cat:) Thanks for sharing it at my party. What a wonderful idea for old luggage, love it. Cute, cute Patti. Love the makeover! 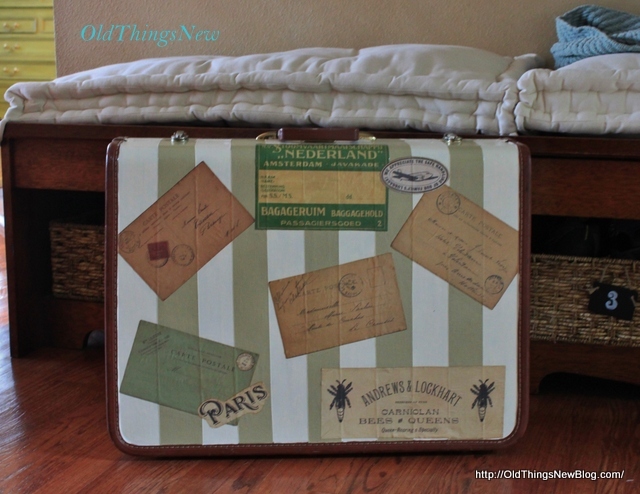 Love this upcycled suitcase, wonderful job! Boutique worthy my friend, pinning! It’s fabulous! 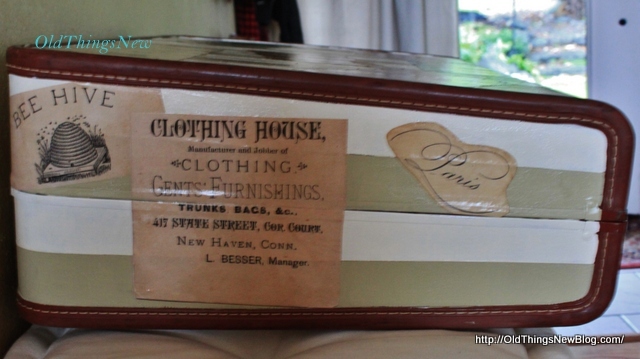 I love old suitcases, too. Great job on the makeover. I love what you have done. I am about to go to the garage to look for paint. I have a suitcase in my living room that has been waiting for inspiration to strike. I LOVE it! You should come show off your creativity at our link party. Oh my goodness, this suitcase is SO cute! I love the graphics and I had know idea baking them would ‘age’ them. So creative! 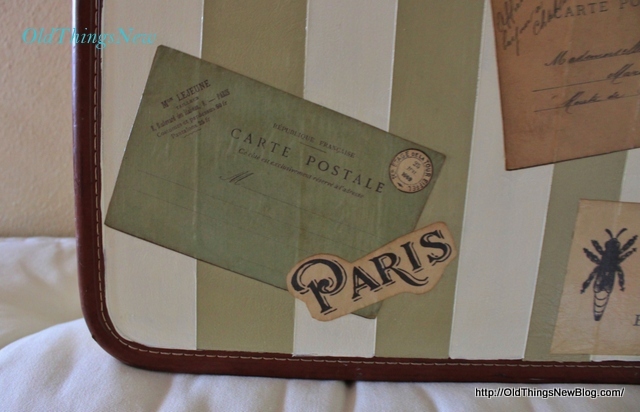 Oh, I am in love with your vintage suitcase! It is gorgeous!! I want one!! You did a fabulous job. Thank you so much for sharing at A Bouquet of Talent. You had one of the top views at the party from last week! Just pinned and tweeted, too! This caught my eye immediately – so beautiful! I recognized those graphics and new exactly where you got them from (I just finished a project using one of them). Thanks for the great tutorial on aging them – I must try this! I found you over at A Stroll Thru Life Linky Party. Lovely makeover! I will keep your way of distressing the adresses in mind! I love the suitcase and have one that I have been wondering what to do with and you have solved that problem! 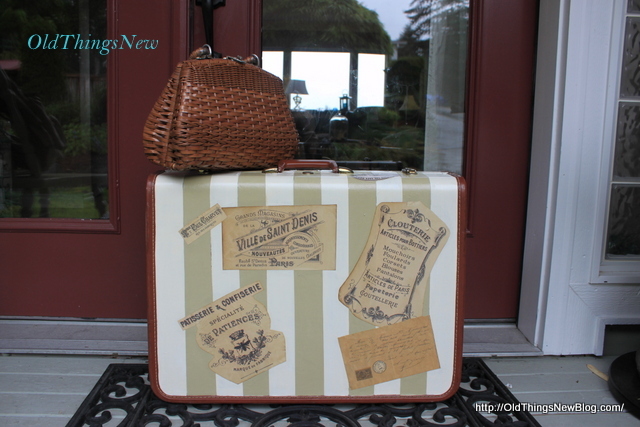 One question, can you paint the chalk paint directly onto the suitcase or does it require a primer? Thanks again for the inspiration! I love the green and white stripes and the decoupage stickers. I just bought a vintage case with some damage on it. I only paid 5$ for it so I won’t feel guilty about painting it or cutting it up. Thanks for the great inspiration.